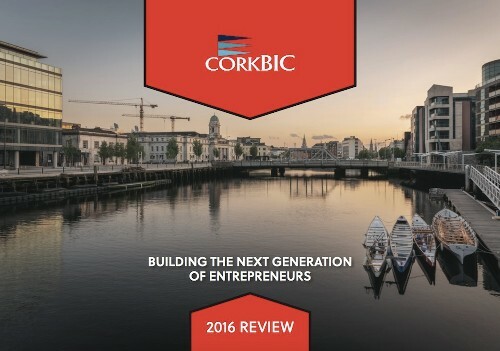 CorkBIC recently launched their 2016 Annual Review at their event ‘Celebrating High Growth Startups’ in the Port of Cork. In 2016 we saw vibrant growth in the Startup sector with 73% of all the companies CorkBIC worked with in 2016 were new to CorkBIC. Many of these startups and early stage entrepreneurs are building and growing innovative organisations employing significant numbers. Of the 100+ companies CorkBIC worked with in 2016, they collectively employ 680+. Speaking at the event were Minister for Foreign Affairs and Trade Simon Coveney TD; Cork City Chief Executive Ann Doherty and entrepreneurs Paul Prendergast, Blink & formerly Inhance Technology; Richard Barrett, Pundit Arena; Aoibheann O'Brien, FoodCloud; Pat O'Connor, Orthoxel and Ellen Caren, Run Angel. Celebrating High Growth Startups is all about encouraging people to consider an entrepreneurship journey and discover if they too could be part of the new economy. The entrepreneurs who participated shared their stories on their path from idea generation to refining the commercial proposition to business planning, raising finance, discussing the pitfalls, challenges and rewards. Opening the event Ann Doherty, Cork City Chief Executive said "Events like this are important to showcase the startup activity and early investment in the private sector in Cork which in turn support the growth in jobs in the region. Cork City are delighted to partner with CorkBIC to support the CorkBIC Growth Pathway initiative which incorporates this event as well as other initiatives like The CorkBIC Entrepreneur Experience and the CorkBIC Venture Academy." Also attending the Port of Cork event was David Merriman, Head of Enterprise Development, Bank of Ireland who commented "We are delighted to partner with CorkBIC on a number of events within the Growth Pathway Initiative. As the number one business bank in Ireland, we are committed to driving and supporting Startup and Entrepreneurship initiatives and events across Ireland." Partners for this event are Bank of Ireland, Cork City Council, Cork County Council, The Port of Cork and Enterprise Ireland.